Ho, Ho, Ho, Festive Cheer coming your way… Here’s a lovely, bubbly Christmas cocktail to tickle your tastebuds – courtesy of our friends at Shaken and Stirred, Oxford. Simple, chic and elegant. 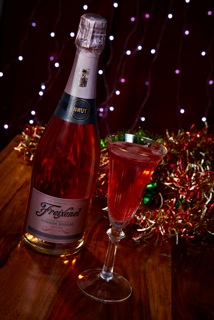 Freixenet Rosado Under The Mistletoe mixes Freixenet’s fruity pink Cava, Freixenet Cordon Rosado, with grape juice to create a refreshing, sophisticated, bubbly cocktail ideal to be enjoyed under the mistletoe. Garnish – No garnish needed!